Sleeper St. and Seaport Blvd. Located across from the Silver Line Court House Stop. 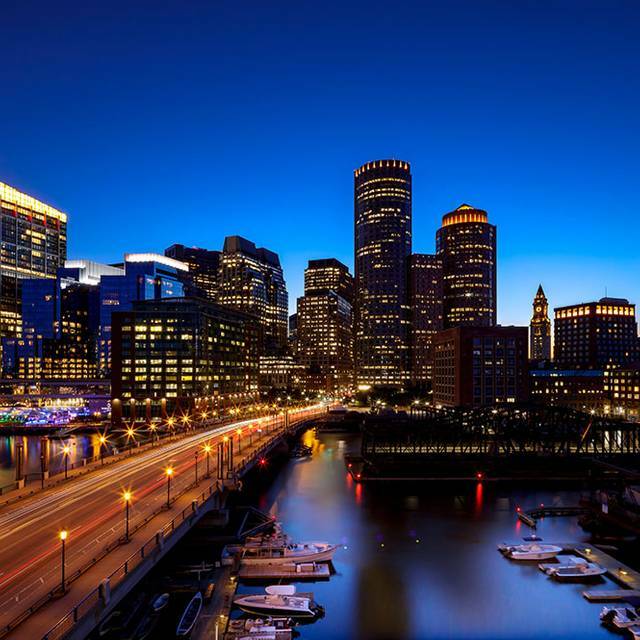 Walking Distance from Red Line South Station and Blue Line Aquarium. Fun time, but they do not serve food on the rooftop. Minimum 500 to reserve an igloo. You are required to drink 500 in alcohol in 2 quick hours and cannot buy a morsel of food. Don’t waste your money. They literally toss you out of the igloo right at the 2hour mark. Honestly I’m shocked they are allowed to do it without offering some kind of food. The igloos were a blast! The service however was terrible! Our waitress thought us middle age people were stupid. When the bill came it had $90 as a service fee. And when we asked she didn’t tell us it was gratuity already included until we did the math. So Taylor was going to end up with $250 tip for bringing 3 rounds! Ya not this time T! We had a great time recently for a co-workers going away party. The igloo is really fun and the view is amazing. Our server was great and very attentive! The only thing I would change is I wish they served food/apps of some kind. Doesn’t even need to count towards the minimum, just would have been a nice option. Would definitely recommend for a fun special event! Igloos were everything and more! Great service and amazing drinks! The view was absolutely fabulous. The vibe was great! Wish it was not so expensive to reserve an igloos but it was worth it! My friends and I all had a great time. We were given a bell inside the igloo to contact our server if and when we needed drinks. We did not use it most of the time because she always came in to check on us which was good. The view was spectacular and the music that played in the background was not overbearing. The only downside is that there is no food. If I could make a suggestion I would say offer finger foods that are not messy if the idea is to keep the igloos clean with a quick turn around after the two hours are up. It’s an experience, but I will never ever return. The drinks on their menu were absolutely terrible! We left over $200 of drinks untouched because they were DISGUSTING! The service was very very slow. The music is sub par! Thank goodness for the gorgeous sky line. Spending $500 is way too much there were 10 of us and it was near impossible! Beer and wine are cheap and the $15 specialty cocktails are disgusting.... they should offer snacks or some type of food! We had such an amazing time in our igloo!! We had a surprise party situation going on that management was happy to accommodate. We were allowed right up and our waitress was outstanding. One thing to note is that if your slot is until 11, last call is at 10:30. We will definitely be back!! This was a 30th birthday celebration. Igloos are amazing great vibe, great music. and fantastic city and water view. My only complaint, if you want to call it that, is they close too early!! Group of ladies had a great night out! Service was great and the drinks are delicious! Reserved igloo for 8 friends and we had a great time! The drinks were yummy and the hot ones as well. We had 2 hours of lots of laughs and the igloos were warm and toasty inside. Love the light up colors and being able to see outside into the Boston Night sky! I would recommend to others for a fun night out! Great way to spend a night out for a Birthday! $50 per person for 10 people was great. There is a bar minimum of $500 in order to reserve igloos. We divided amongst 10 to be fair for all. Almost 2 hours later and we were only up to 365...so a few order extra drinks to spend the 500. There is no food available here and that is a lot of alcohol to drink in a short time. A few of us drank more than we had wanted but The experience was awesome!! The Igloos are plastic as well as chairs inside and they are all lit a different color and heated! The music was great and the service was outstanding! I say it’s a must do event! I just think that they should have food or some kind of buffet available for people to soak up some of the alcohol...could be dangerous for some that don’t know limits. Loved the experience! It would have been a lot better if they served appetizers but I definitely recommend it. Keyla was also amazing! Best time. After 2 hours we were looking for more. Pricy but worth the experience. Amazing time and a great way to finish a night...even in a snow storm! The Envoy Hotel has a gorgeous view, and the service is lovely if you actually stay at the hotel. The servers on the rooftop, however, are very rude and slow. I would not recommend getting a table in the summer or an igloo in the winter. We had a blast in our igloo! I think the only thing was that because there was no food, it made it hard to make sure everyone came with a full stomach. I think having even an appetizers menu would make this even better!!! They should probably tell people that there is a $500 minimum spend for 2 hours. Also it was really cold and the heater that they provide is not adequate for a cold night in Boston. 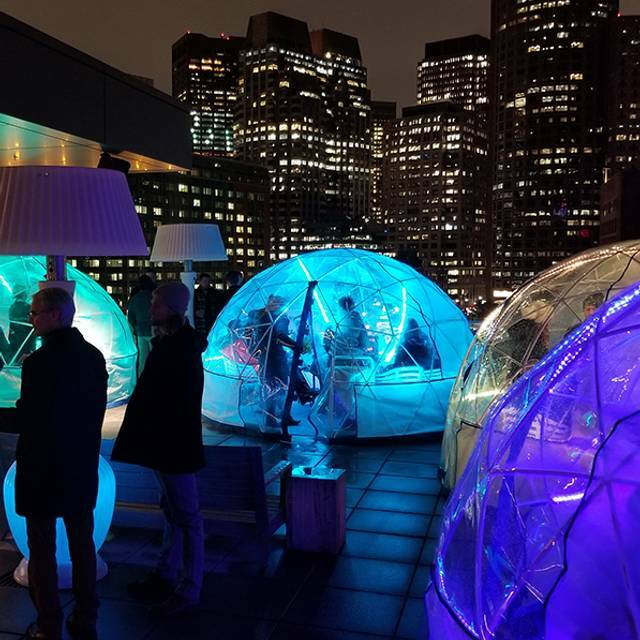 Very disappointing experience with Igloos for NYE. While we were told this was the place to be for NYE, we booked an Igloo for 10 people and confirmed a $500 minimum and a reservation at 9 pm. The manager called multiple times to confirm the reservation in the days leading up to NYE including 10 people and $500 minimum. All sounded great..
NYE at 8 pm, I went to the host to confirm that they would not give up our table if our dinner ran late and we were not there by 9. It was then that I was informed our reservation was only for 9-11 - i.e. they would kick us out of our table at 11 for a new reservation celebrating NYE at midnight. While I knew there was a $500 min. and a $200 cancellation fee, being kicked out of our table at 11 was new information to me. The Igloo manager offered no solution and just stated that was their policy and I'd be charged $200 for cancelling the reservation. I received a text with a screen shot of the policy after debating the charge - there is no mention we'd have to leave at 11 on the reservation confirmation sent from OpenTable. Who books a NYE reservation for 10 people so that they have to leave the table and bar at 11!? While the manager was so prompt to call me 3 days in a row to confirm I knew about the $500 minimum, why wouldn't he have confirmed we would have to leave at 11 and not have the reservation at midnight as desired? Even worse is that Igloo is at the Envoy hotel (owned by SPG) and I'm a loyal Platinum member with SPG. We stayed at the hotel for 2 nights during our stay and still spent our money within their property anyway at the hotel bar which would accommodate us at midnight. Igloo feels like a simple tourist trap. If you're looking for a cool view of the city, I'm sure you'll enjoy it. If you're looking to feel good about your experience then look elsewhere - Igloo left a very bad taste in my mouth. For the record, I enjoyed the Envoy (location and hotel) and had a good time at the hotel bar. We had an amazing time. Kayla was our server and she was fantastic! Prompt, friendly, and informative! Highly recommended! The drinks they provide are excellent! I definitely would go back! The Igloos are beautiful, great view, but expensive! You get no food and you have to meet a minimum of $50 a person. If you don't, you still get hit with that $500 which is not fair. Space is tight, IKEA chairs with table and a space heater is all that was in there.. The waitress got our bottle order wrong but the manager was kind enough to fix our bill for us even though we did not drink $500 worth of alcohol.. Make sure to eat before sitting in a tightly spaced igloo for 2 hours getting drunk since not even a cheese platter is offered. On the plus side, the igloo is rain proof thank god cause it was raining on my birthday. Went with a group of 10 for my birthday! Had a Ball!! 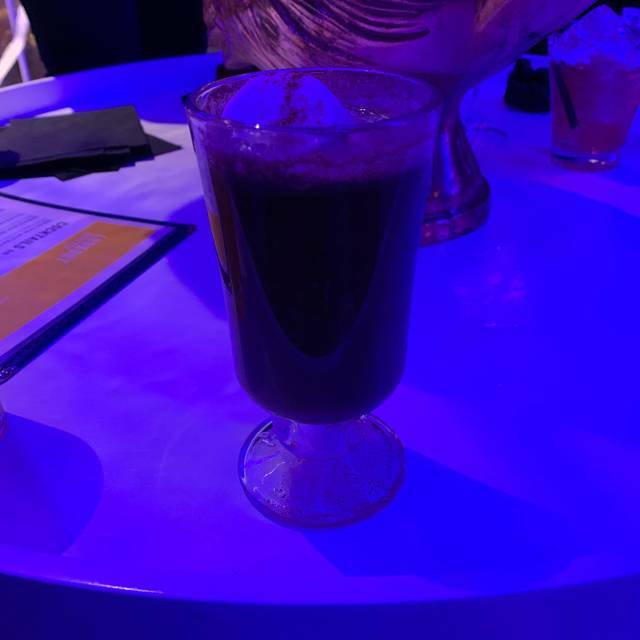 Great drinks, and a perfect place to take pics.. A little pricey, we reserved and igloo and had to run up a $500 drink tab (not including any food as food isn't served) Otherwise a lot of fun! 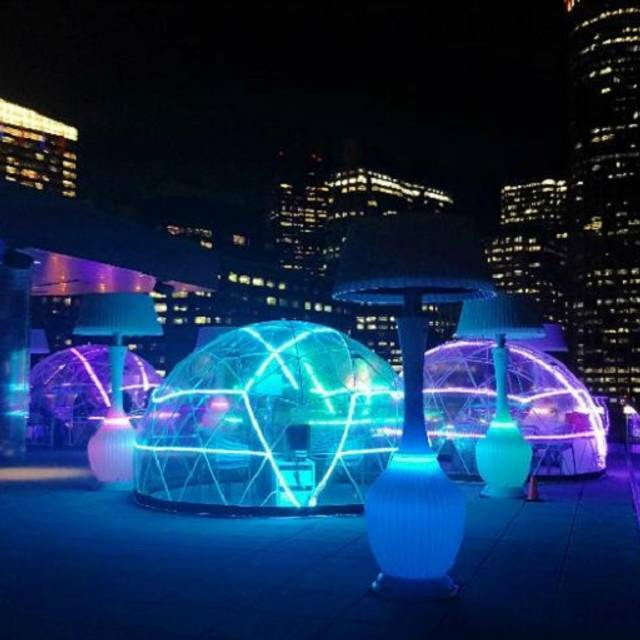 The Igloo at the roof top bar was such a blast. We had reserved an igloo from 4-6 which is the allotted time you get with a reservation. There is plenty of room for 11 people even though they recommend 10 as the max. It stayed very warm inside with the space heater and we had the door open. Heat was set at 85 and had to turn it down to 65 once everyone was in. The service was excellent. Our server was very prompt and attentive and kept us in the loop on how much we still had to spend. I highly recommend this for a fun get together with friends before dinner. My only complaint is the $500 drink minimum you have to meet with a reservation. It’s too high for a place where food/light apps are not served. We felt such pressure at 5:45 when we hadn’t met our limit to order more drink than we should have had. I also disagree with the $50 extra they charged for having an additional person for 1 of the hours. Only 2 were drinking beer. The rest were mixed drinks and wine. The cider sangria is delicious. They promptly asked us to leave at 6:00 as there was another reservation at 6:30. We then moved outside under the heat lamps and they allows us to continue to reach our drink minimum for another 1/2 hour. We didn’t get food so I can’t vouch for that! But everything else was great!!! Atmosphere was amazing , really cool unique experience ! We had a great time as a group renting this igloo for the 2 hours and the $500 minimum. We did reach the $500 but with 2 hours of drinking some sort of food should be offered. Even something as simple as trailmix, cheese platters etc. I brought a group of VIPs for work to the Igloos. 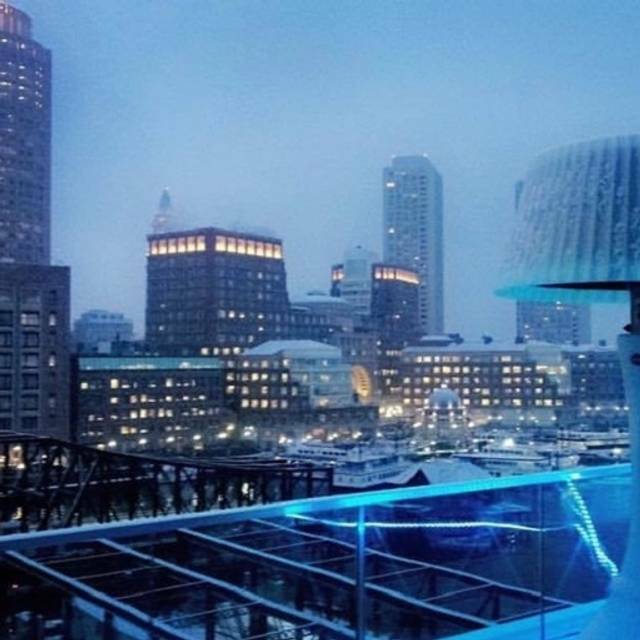 Our server was terrific and the fun of the igloo experience and the skyline of Boston was spectacular. It is a bit pricey to reserve but with a full party it is well worth the experience. Note they do not serve food on the rooftop so my 3 stars was merely to not lower the overall average. Very lame and not nice. I would not recommend the “Igloos” (aka plastic tents with ikea furniture). We went for my sister’s birthday with a group of friends. The service was atrocious. The experience was not cool nor special, and the focus on the evening (by the Envoy) was us meeting the $500 minimum. $500 across 10 people is not a big deal and they detracted from the experience by sharing the “rules” repeatedly. Also, despite the fact that we had the igloo reserved and had agreed to this sum, they hassled our guests and would not let them in until we had to ask or waitress for help. We asked multiple times for water and the waitress complained she had to go downstairs to get it (makes 0 sense, but I don’t care - I expect to be brought water when requested) and this was never delivered on (she didn’t care because tip is already included when you receive your check). They made us leave our igloo at the 2 hour mark (which we expected) but we were the last reservation and after we left they let others sit in it! Why kick us out when we had paid? The drink choices were not good (awful champagne and wine list) and the cocktails were less than tasty. Everything is served in scratched up plastic cups... this is marketed as a luxury experience and it was anything but. Huge waste of a night. Also, I should note we are frequent customers of the Envoy roof deck - this will be our last time. Very lame - don’t go!!! 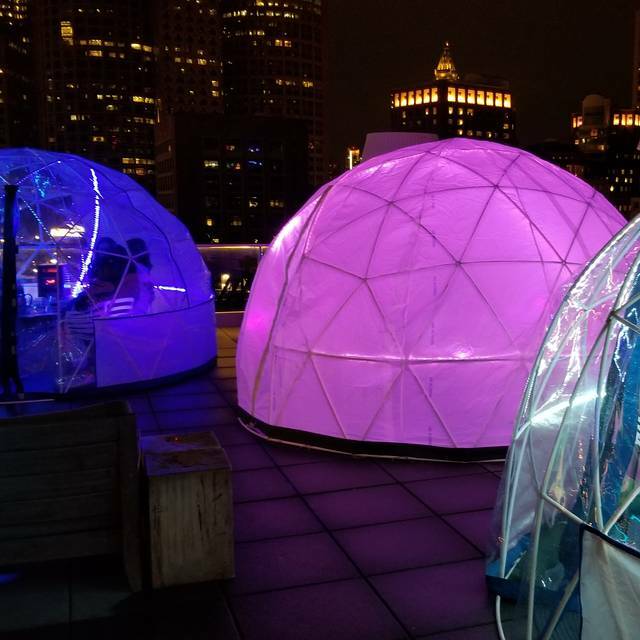 Absolutely outstanding experience in the igloos on the roof! Everyone loved it. Definitely worth the price and very reasonable compared to cost of reserving a room for a party at other venues. Staff were attentive and kind. Amazing view and warm even on a cold nite. Note on ratings - there is no food served at the rooftop (hence my rating of 1 star) but we had dinner at Outlook in the Hotel, which was top notch. I loved the ambiance/atmosphere. It was a great spot. The only thing was they didn’t offer food, not even snacks and you couldn’t bring anything in there. 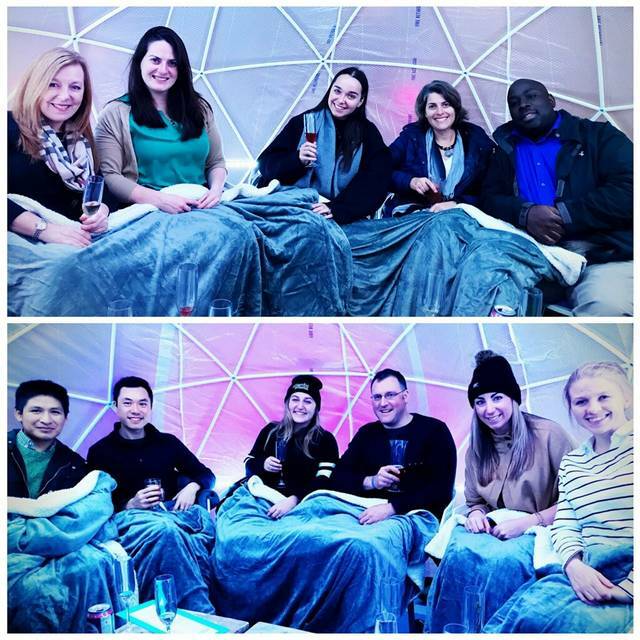 We reserved an igloo for 10 people at 6PM (around dinner time) and we had to drink on an empty stomach. They also didn’t offer regular ice water- you had to purchase a $5 bottle of voss if you wanted to stay hydrated! add food and water and it would have been perfect! 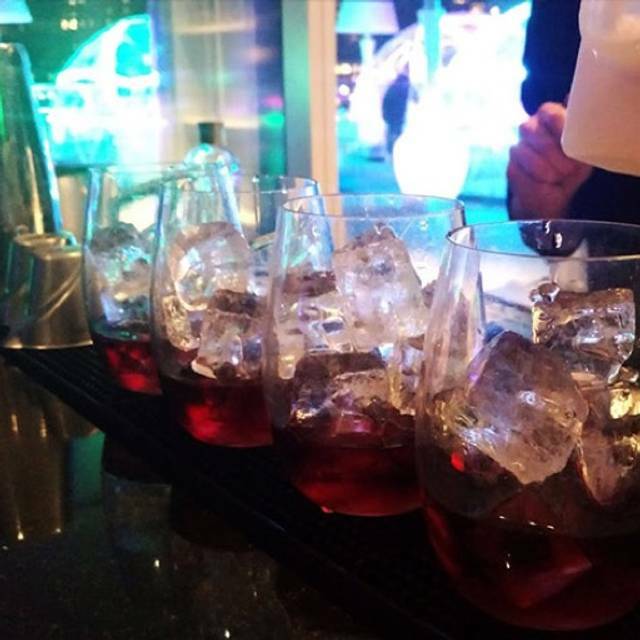 The Rooftop Lookout and Bar at the Enviy Hotel is the perfect spot for a special occasion! A group of 9 of us shared one of their enclosed igloos for a reserved period of two hours and had an absolute blast! The igloos were super cute and very comfortable. The staff was gracious and accommodating, the drinks with generous and the views were stunning! I would absolutely recommend booking one of the igloos for a group outing if you’re looking for that something special to make your night particularly memorable! ***didn't eat food because we were on the rooftop. The igloos were great! We went for a surprise birthday and were taken care of from start to finish. Can't say enough good things about the service. Drinks were good too! It was fun but it took awhile for drinks at times and was annoying to have to go down the elevator for the restroom.